The Second Edition of the Carousel Book has been released. Due to the popularity of the first Carousel Book a second edition with more pages and pictures was released. This book can be purchased at the Giftshop @DiscoveryNorthBay, at the ticket van at the Heritage Railway & Carousel Co. or various merchants including Gulliver's Bookstore. Heritage Carousel Colouring Book depicting sketches of all the Heritage Carousel horses as well as a legend by Edna Scott providing suggested colours and two different colour photographs by Ed Eng on the front and back covers. The colouring book is available at the same locations noted above. Miniatures of Heritage Carousel horses can be purchased. 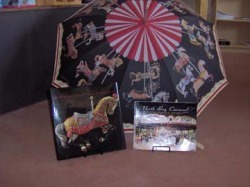 The set of 4 represent the different styles of carousel horses. The batch includes: Biscuit, Pearl, Dream Weaver and Sir Winsalot. Only four hundred copies of each horse will be produced in this first batch, and can be purchased at the Giftshop@DiscoveryNorthBay. If this fund-raising activity is successful other horses may be produced at a later date.